Kids practice listening all the time. When they listen to conversation, instructions, music, or a story they are developing their listening abilities. However, Spanish learners also need to practice specific listening skills. 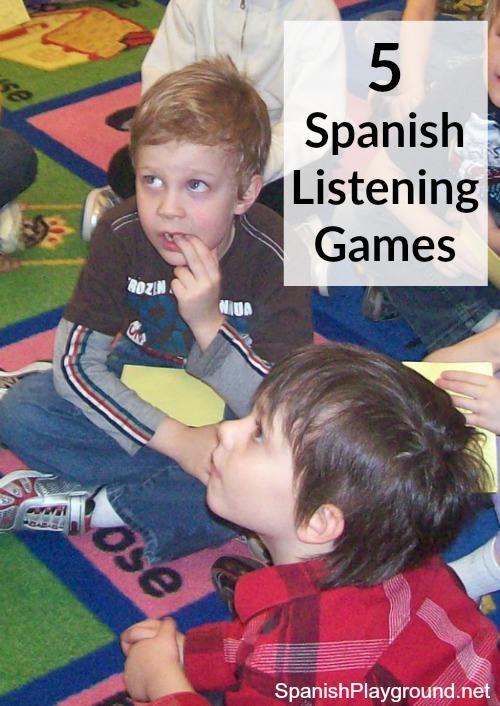 Spanish listening games are a fun way build this important language skill. You can also review vocabulary with Spanish listening games. Ordering – Provides practice listening for the relationship between words and practice with prepositions. Kids place picture cards in order as you say them. They can be in a straight line or a grid. Then give instructions for kids to change the placement of the cards. Pon el perro entre el caballo y la vaca. Pon el ratón al lado del gallo. Listen and Draw. – Practice following instructions and vocabulary. Do Three Things – Practice holding language in short term memory. This simple activity is excellent language practice. Kids listen while you give three instructions in a row. Depending on the level, the instructions can be related or not. For example, you can say: Toca la nariz. Abre y cierra los ojos. Toca los pies. Unrelated instructions are more difficult: Dame un lápiz. Toma agua. Salta en un pie. or Cierra la puerta. Pon un libro en la mesa. Siéntate. Picture Card Race – Practice hearing a key word in a sentence. Practice recognizing related words. Kids place the picture cards face up. Use one of the words in a sentence. They find the card. Playing this way they practice listening for a key word. To practice recognizing related words, describe one of the words. You can make this a race using one set of cards for two or three students. Story Listening. – Practice recognizing a word in context. In this activity, it does not have to be a key word in the story, but it should be familiar to kids. If you are using word cards, this is a good way for early readers to practice word recognition. Give children 6-10 picture or word cards from a story you are going to read. Place the cards face up. As you read the story, kids turn over the cards when they hear the word. With repeated words they only turn it over the first time. They are listening for the pictures they can see. Young children can put the cards into jar or a box.